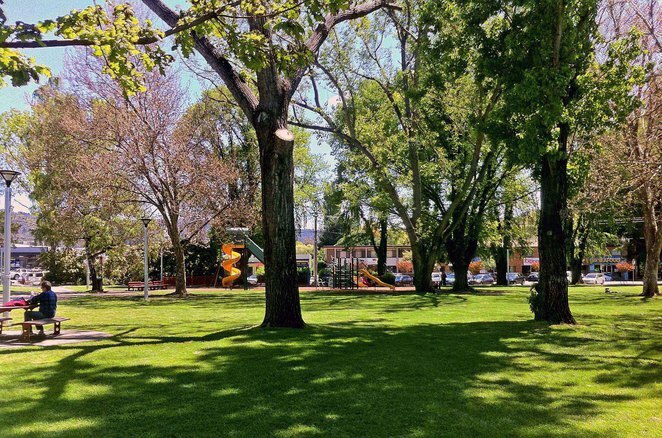 If you happen to be passing through Cooma on the way to the mountains or the coast, take a well-earned break in the centre of town at Centennial Park. This beautiful area, with its towering deciduous trees and large expanses of lawn, offers a range of features to passing travellers and visiting families who need a break from the hustle and bustle of everyday life. 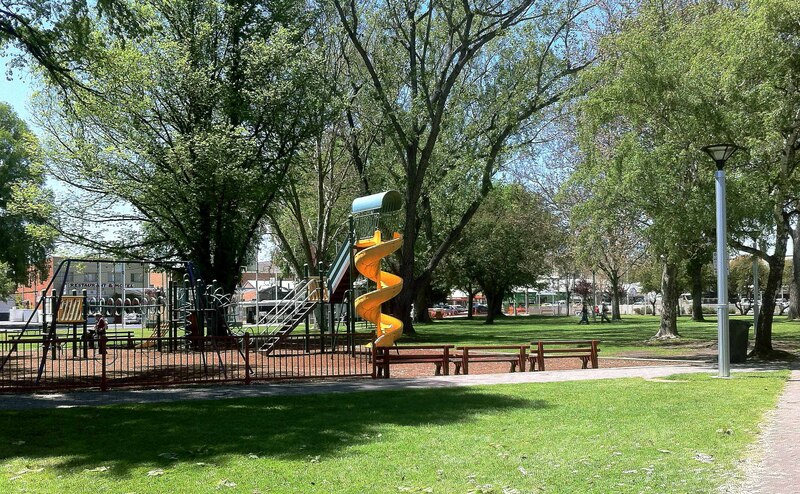 The Park offers facilities, space and tranquillity, depending on the visitor's requirements. The band shell houses toilets and a baby change room, while cafes and grocery stores are a short walk away. The Cooma Visitors Centre is located at the corner of the Park in Sharp Street. Easy access to most features is via paved pathways. Although domestic animals aren't allowed in the Park, if you have a thirsty hound travelling with you, there is a handy tap on the Massie Street boundary. 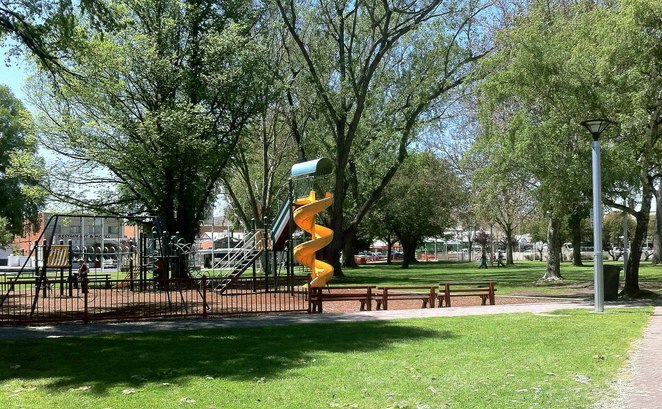 Kids will love the swings, climbing frame and slides in the playground area. There are plenty of picnic tables, and ample room to kick a footy or to find a quiet spot for a quick kip. The Park is a historical and cultural feature of Cooma. Initially a swampy area, it served as a market garden and an informal rubbish tip, before being transformed into a recreational area. It was officially dedicated in 1888, celebrating the centenary of Arthur Philip's arrival in Australia. During World War Two, slit trenches were dug in the Park, offering locals shelter against potential air attack. 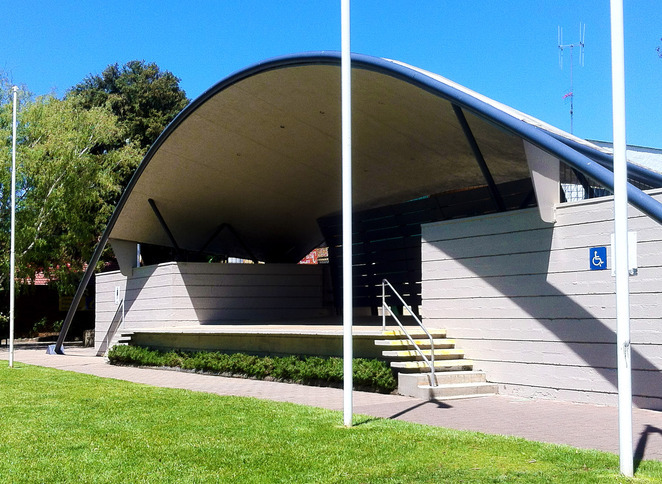 The present band shell, constructed in the 1950s, has seen much use in the past decades. Used often for concerts and naturalisation ceremonies, it has also been a staging point of many public meetings and protests. This impressive structure also offers shelter from any nasty weather that interrupts your visit, as does the covered bus shelter on the opposite end of the Park. 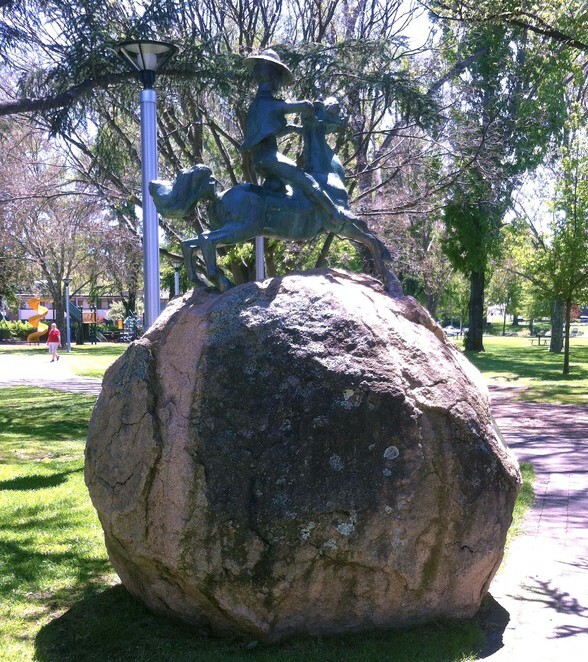 For those wishing to stretch their legs a little further, the Man from Snowy River Statue stands on the Sharp Street side of the Park. This bronze statue, created by Ian McKay, is a tribute to Banjo Paterson, author of 'The Man from Snowy River'. North of the statue are the beautifully designed and coloured mosaics that make up the Cooma Time Walk. This monument was created by artist Chris Graham and students from Cooma TAFE. The forty mosaic images portray historical and cultural aspects of the Monaro district and were installed as part of the area's Bicentennial celebrations. Adults and children alike will delight in following the progress of time conveyed by these wonderful artworks. Also located nearby is the Snowy Mountains Scheme terrain model, donated to the town of Cooma by Metal Manufactures Limited of Port Kembla. 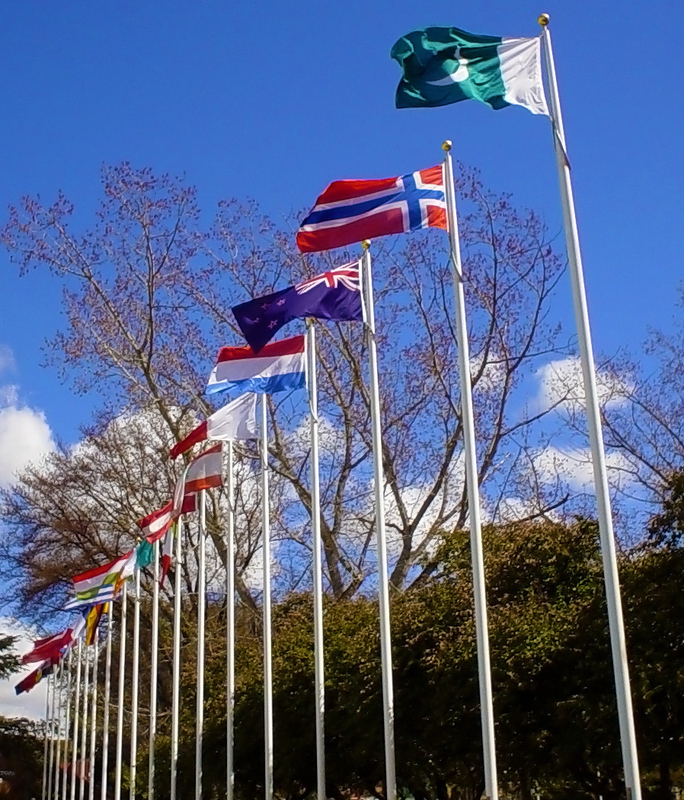 Located on two sides of the Park is the Avenue of Flags. Near Sharp Street are twenty-eight flags representing the home nations of the thousands of workers that travelled to Australia to work on the Snowy Scheme. These flags show designs current during the 1940s and 1950s - the American flag only has forty-nine stars and the Canadian flag includes the Union Jack. 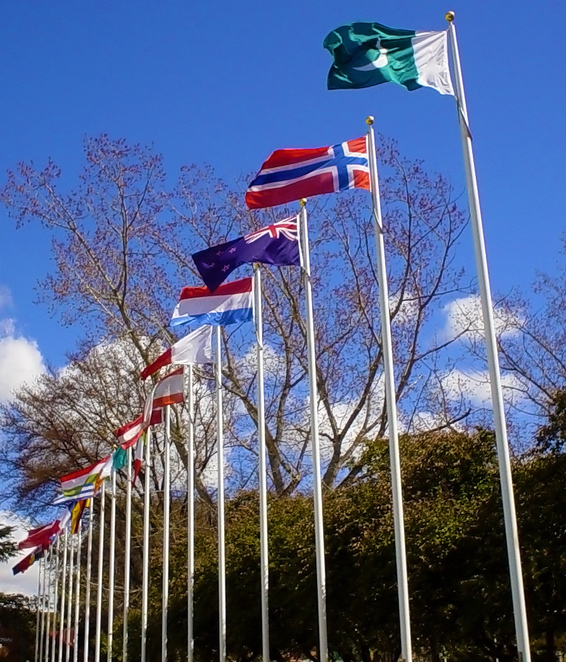 Along the Bombala Street side are displayed flags of current designs that have superseded some of the original flags. The avenue has seen some controversy since installation in 1959. The Communist Yugoslavian flag was sometimes stolen, and more recently there have been calls to update the South African flag from its installed Apartheid-era version. If you happen to hit the Park on the third Sunday of the month, you'll be treated to the Rotary Markets, including stalls, music and refreshments. Other events utilising the Park during the year include Christmas Carols, the Tour de Snowy, the Snowy Ride, the Australian National Busking Championships and the Million Paws Walk. Make sure that one of your visits to the Park occurs during Summer or Autumn. In the hot weather, the Park is an oasis of shade beneath the canopy of greenery; while in Autumn, the deciduous trees turn on their best show of colour. Finally, if you're lucky enough to visit at the right time, you may get to meet the unofficial owners of the Park - a brazen family of ducks that, due to their comings and goings from the nearby creek to the Park, have their own sign-posted duck crossing on Massie Street. Come and enjoy - fresh air, peace and sunshine are all free!